The dance of the sun and earth has inspired celebrations of the human spirit, expressed through art and music, throughout the ages. Honouring many cultural traditions, the annual Winter Solstice Lantern Festival illuminates the longest night of the year with lanterns, fire, singing, drumming, music and dancing! Come celebrate this free community event with a glowing constellation of lanterns shining in five Vancouver neighbourhoods. These five little festivals are community-based and reflect the unique nature of each neighbourhood. Intimate and accessible, each invites your participation. 6:00 – 7:00pm – You may want to start the evening with an intimate concert in one of 3 beautiful neighbourhood homes. Each house will feature performers and have lanterns for sale so you can join the lantern procession immediately following the concert. Entry by donation. Bring your friends, families and lanterns to celebrate the return of light in your neighbourhood! Come to Britannia at 6:00pm for the ceremonial lighting of the amazing Swedish Fire and warm yourself all night with music from such wonderful groups as Voices Rising (choir), Quatro (beautiful four-part harmony), East Side Enchantment (participatory singing – you can join in!) and Backspin (big bluegrass fun)! And when the procession arrives around 7:15 you can dance wildly in the courtyard to the joyous Eastern european music of Orkestar Slivivica! 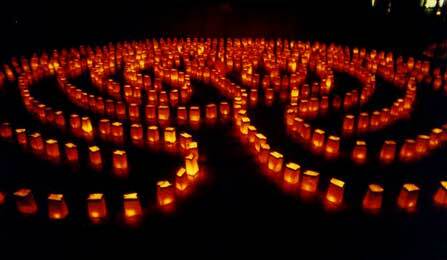 You will not want to miss the fantastic Labyrinth of Light glowing all night long with the beauty of 700 pure beeswax candles. Walk the meditative path of the Labyrinth of Light and immerse yourself in the sounds of the crystal singing bowls of Christine Paton and the didgeridoo mediation of Breathwood. The labyrinth has long been used for meditation, prayer and sites of ritual in various cultures around the world. Created with over 700 pure beeswax candles, the winter solstice labyrinth invites you to warm yourself in a self-guided ceremony intended to help release old attachments and envision new possibilities as the darkest night of the year births a new season. Free music and food at the Gathering Place (609 Helmcken) from 1:00 — 5:00pm, with a procession at 5:30 to Emery Barnes Park. These three lantern processions are led by drummers along the seawall as well as through historic Yaletown to converge in David Lam Park where they are welcomed with a spectacular fire performance by Fire Tribe. Once again the Roundhouse hosts a stunning array of indoor festivities! Join the Opening Welcome by Master of Solstice Ceremonies Ari Lazer and get introduced to all the performers. Sit beneath the giant Tree of Life in the Secret Lantern Garden and enjoy the eclectic world fusion music of Naad created with rare and beautiful instruments from all over the world. You’ll be entranced by the gorgeous lantern creations of artists Nels Holm, Joey Mallett, Naomi Singer, Glen Andersen and community members. Learn about the celestial origins of winter solstice with community astronomer Bill Burnyeat in his Skylab, and create a constellation from your own imagination with artist Heather Jones. Be entranced by the aerial dance of Kira Schaffer of Firebelly Performance Society or have your spirits lifted with the Slavic soul and seasonal Eastern European music of Zeellia. If it’s dance you love you’ll be thrilled as the Russian gypsy musicians and dancers of Roma Gry take over the stage. You’ll be dazzled by traditional English folk dances of the Tiddley Cove Morris Dancersand inspired by the Roundhouse Community Dancers. And you may find it impossible to stand still when the Jack Mandu begins to play. Open yourself to Illumination from the Depths — A Space for Contemplation, Magic and Mystery created by The Travelling Alchemists’ Outreach Society. And be sure to stop and listen to Clara Fiddlehead as she roams the halls with her violin or to Jack Garton as he strolls by with his accordion. Starting with a big drum jam in Leg-in-Boot Square, the crowd splits in two with one group heading east to Creekside and the other heading West to Granville Island. Expect fond farewells and just a touch of chaos! The 3 processions converge on Granville Island and are greeted by the traditional torch-lit Song Of Welcome by The Vancouver Morris Men. The Carnival Band, the Rhythm Spirit Drummers join forces to lead everyone over to Ron Basford Park where the Vancouver Morris Men will perform, for the first time in Vancouver, the Abbots Bromley Horn Dance. Then the Vancouver Fire Collective will weave their fiery magic and a giant fire sculpture of the rising sun lights the darkest night. Warm up inside with the jazzy genius of Djangoesque or dance wildly with the unpredictable and energetic Carnival Band. You definitely will not want to miss the beautiful dancing and singing ofIndian Time Drum Group featuring two generations of jingle dancers from the Prince family. Enjoy the inventive storytelling of Mind Of A Snail Puppet Co. featuring shadowy puppets and visual delights. Keep your eyes, ears and hearts open for the offerings of roving Mistress of Ceremonies and Ritual Historian Shauna Born as she shares her vast knowledge of solstice traditions – just look for the lady in the top hat! Heat up solstice with the incredible energy of Jacky Essombe as she leads you in sun-inspired African dance! Bring your drum or jump in and borrow one – this huge drum jam hosted by Ron Stelting & Friends will feature some of the city’s wildest rhythm-makers! Come celebrate the 18th Annual Winter Solstice Lantern Festival and the first year at Creekside! Starting with a big drum jam in Leg-in-Boot Square, the crowd splits in two as one group heads West to Granville Island and the other heads East to Creekside. Expect fond farewells and just a touch of chaos! Led by the drums of Lyle Povah the crowd is greeted with an exciting seaside fire performance by M. Pyress Flame & Friends. Warm up with hot chocolate and get serenaded by the saxophone of Shane Krause as larger than life stilt-walker Lindsey Longlegs welcomes you to the solstice celebration. Be sure to sign up to walk the meditative path of the Labyrinth of Light and be enveloped in the crystal bowl tones of musician Lori Bella (see below for labyrinth details). Head upstairs and join The Legion of Flying Monkeys Horn Orchestra as they play amazing hand-crafted instruments created from giant plants by Mr. Fire-Man – you can dance and sing along! Be sure to stop into the quieter room down the hall where the Lost And Found Puppet Company tells stories of wintery mystery through the magic of shadow puppets. Join a lively lantern procession led by the drums of Russell Shumsky & Friends through the streets of Strathcona for a magical evening at the Dr. Sun Yat-Sen Classical Chinese Garden and Park. Celebrate the Chinese winter solstice, dong zhi, which marks the rebirth of the yang qualities of light and energy. This year the Garden comes alive as never before! Move to the samba rhythms of Drum Syndicate, enjoy a choral performance by The Real Treble Makers and raise your spirits in the Winter Solstice Music Ceilidh featuring Toddish McWong and theBlack Bear Rebels & Friends. Enjoy the beautiful heron and koi lanterns created by artist Joey Mallett, the whimsical tea set lanterns of Carmen Rosen, and the ginko and red maple tree lanterns hand-crafted by Garden volunteers. The floating installation “Heaven and Earth” by artist HyungMin Yoon, inspired by a 6th century BC Taoist saying, poetically rearranges itself with the movement of the breeze. Add your own dash of colour to the 3rd Annual Community Lantern hosted by the Community Arts Council or join artist Haruko Okana and contribute to the community lantern shrine “The Lightness of Hope”. View a collection of stunning antique lanterns in the Scholar’s Study while enjoying the Pandora Benevolent Society’s “Replay Your Tea With Me”, which marries the traditional performance art of Chinese Gong Fu Tea ceremony with video processing, enhancing interpersonal connections and expanding the Sacred Space cultivated over the preparation of a cup of tea. Treat yourself to fresh warm buns baked by Bonchaz right in the Hall Of One Hundred Rivers. Stroll the nighttime paths of this beautiful park and be dazzled by the lovely lantern creations of artistsYoko Tomita, Matt Pearson, Nels Holm and Jacquie Rolston and linger in the environmental jazz of Saul Berson and Paul Blaney.